Edinburgh City Council will vote on whether to continue the management arrangements for the controversial centre. Edinburgh City Council faces a half-million pound bill to replace the roof of a controversial activity arena opened less than a decade ago. 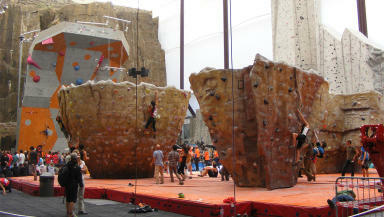 A report prepared for the council’s culture and sport committee, entitled “Independent Review of Edinburgh International Climbing Arena, Ratho”, recommends that repair work on the EICA begin in the spring. The proposal will require £550,000 in funding, on top of the almost £10m the council spent buying the centre and completing the building. The council will vote on Tuesday either to continue the current management arrangements or make a change. However, the report warned that choosing to put the management contract out to tender or terminating the lease would cost the taxpayer more. The EICA has experienced a volatile past, opening in 2003 before closing in 2005 when its owner went into receivership. The arena reopened in 2007 under the leadership of Edinburgh Leisure, an arm’s length recreation services provider which receives funding from the local authority. The council spent £3.87m to buy the facility and a further £5.82m in completing its building. The report also recommends that “current management arrangements” for the EICA remain in place, advising the council to “continue with the current management arrangements at the EICA and give Edinburgh Leisure an assurance that the Council will not seek to change these arrangements until the end of March 2016 at the earliest”. The document concluded that maintaining the status quo “would have a minimum impact upon the council”, noting “there would be no direct financial benefit but neither would there be any additional unbudgeted costs”. The review also considered the option of inviting other bids for the management of the arena but pointed out that while this approach “may appear attractive… the financial history of the centre would suggest that an operational subsidy would be required for any operator”. This, the report added, would cost at least £500,000 in the first year alone. The local authority was advised against terminating the lease altogether because it could force the council to pay Edinburgh Leisure between £800,000 and £1.2m, repay the Scottish Government £700,000 and find £300,000 in additional investment to maintain and secure the centre while it was out of use. The report cautioned that, given the current economic situation, the council would be unlikely to recoup its investments in the arena if it chose to sell the facility. The roof replacement was initially recommended in a report to the policy and strategy committee in December 2009 but work was postponed until publication of the new report. Councillor Richard Lewis, the city's culture and sport convener, said: "The EICA continues to perform well under Edinburgh Leisure's management with visitor numbers showing impressive growth year-on-year. "The replacement of the centre's roof remains a priority and this work will begin shortly after the IFSC European Youth Cup in June. We will of course work closely with Edinburgh Leisure to minimise any disruption to their customers."